In the end, he settled on ‘Now We’ll Never Be Divided’ taken from our very occasionally sung, Sham 69 based chant that reflects upon our club being the union of two others. It did get me thinking however as to what other Charles Dickens books might be usable for club-based blogs. Mind you, given his appetite for titular characters, there isn’t a great deal of candidates. ‘Hard Times’ would probably be shared around season-by-season, bestowed upon whichever club was staring hardest at the wall. This season, Weymouth and Lewes would probably have taken it on time-share. ‘Great Expectations’ could, similarly, be given to any number of clubs including, I dare say, my own, although that probably would have applied more last season than this. When it comes to ‘Bleak House’ every non-league follower in the country could nominate at least one club for the ‘honour’, whether they mean it to refer to a place they traditionally do less than well, or just a place they find austere and depressing. It is for the latter reason that I choose Thurrock as, over the years, it’s been a pretty happy hunting ground. 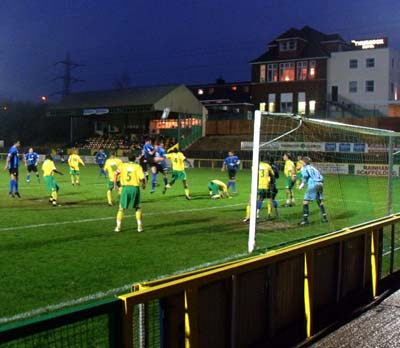 Six wins (if you include a 4-0 win over Dartford nine years ago when they shared the ground with the then-named Purfleet FC) and a draw (plus one abandonment when leading 1-0) is a return I doubt we could rival at many other away grounds that we’ve visited regularly. Indeed it is only a short British fortnight since we last went there, coming away with a 4-1 win in the FA Trophy. It is also quite a neat little ground with a chocolate box of a main stand and a quaint brick outhouse that houses the dressing rooms. Yet, it’s location just off the M25, next to a hotel in the middle of nowhere relatively speaking means it is hardly Worcester or Weymouth in terms of being rock solid beano territory. As a result of this location, very few people go to watch them, and this hardly makes for a winning atmosphere. Today’s fixture was announced as 246 but I’d be astonished if any more than half that were inside the ground. Rumours over the years have suggested that guests staying at the Thurrock Hotel receive match tickets as part of their deal which inflates the numbers but I can’t vouchsafe for their credibility. Now I’m no Trinny, and not much of a Susannah, but lots of bare flesh, mini skirts and high heels should, surely, be discouraged for people still studying the middle school curriculum. I suppose one might argue that at least they brightened up the place. Perhaps I am tainted by the walk we London Branchers traditionally undertake from Purfleet station to the ground which passes a derelict factory looking on the verge of collapse, an oil storage depot and about two shops in its 40 minute duration and little else. With the dankness of winter and returning rain hanging over the wet ground, and a performance turning from fair to middling to wretched in a fairly rapid manner, this ol’ house was even more bleak than usual this weekend. After twenty minutes I turned to my chums and said “I feel confident” as things were going quite well, Thurrock didn’t look much cop and good in-roads were being made. We have been here before though and I was quick to add “Oh dear” to the previous remark knowing that nothing is more likely to scupper us than a resurgence in my belief. As the game went on, Hotel Greyskull’s neon signage grew ever brighter amidst the drizzle, peering over the playing area from its mezzanine plinth, and beneath it, like a portrait in an attic, the Hawks dimmed by way of contrast. A nil-nil draw away from home against a team who have been up among more celebrated names in the play-off places for most of the season is not to be sniffed at but the worry is that despite the odd good result, the early season vitality is unlikely to return. This past week we have won a game, drawn a game and been scalped by a side three leagues below us in the Hampshire Senior Cup so in theory a mixed bag but the most worrying thing is that the only goal in that lot has come from a kindly opposition boot and not in an ‘oooh wicked deflection’ way. Our attacking force, so lively at the start of the campaign, is in absentia, mainly because the one source of those marvellous goals, Manny Williams, seems to have lost his mojo somewhat. He was so off the pace today, had it been a 10,000 metres steeplechase, he’d have been danger of being lapped by a rusty shopping trolley with a missing wheel and no external means of propulsion. One hopes that his confidence and form can return in the coming weeks as he was largely the reason that the first couple of months of the season were so enjoyable. This draw would have been much more acceptable if it hadn’t followed a humiliation at the hands of a Wessex League side or if there had been anything other than a racking up of injuries (Ryan Woodford, Wes Fogden) and suspensions (Manny) by way of incident. This was pretty poor showing (after the initial burst) against a team that offered very little by way of threat. To put it simply, this was a rubbish game in a ground with all the party atmosphere of an Amish memorial service. As another of my terrace colleagues, Spud, remarked towards the end of the game, “It’s been like watching Bolton play Bolton”. That line, I think it’s fair to say, was the highlight of the entire 90 minutes.